One of Chicago’s most iconic sounds rises from the pushcart paleta vendors jingling their bells around public parks, reminding both young and old the imminent possibilities of cold refreshment—mostly sweet, but sometimes a little savory, too, and spicy. Out of all those flavors, one of my favorites is coconut, a creamy cold treat that always transports me someplace else with just one bite. All paletas are easy, but coconut ones are both easy and unique. Though you’ll find lots of people suggesting you make them in small paper cups (a little awkward), they’re way easier if you have ice pop molds. They’re easily available on line. 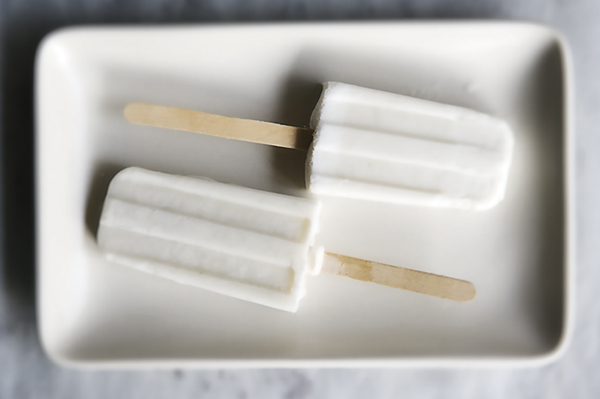 Quick word of advice: The easiest coconut milk to use for making these pops is one that has a little natural stabilizer (often guar gum; check the ingredient label on the label), which keeps the coconut fat evenly distributed through the milk. You can certainly use light coconut milk , too, but it’ll give your ice pops a skim-milk feel. In a blender, combine the coconut milk, sugar, lime juice and zest. Blend for a minute or two, until the sugar has dissolved. Pour the mixture through a fine-mesh strainer into a large measuring cup or pitcher, then divide it evenly among 10 to 12 ice pop molds, leaving about 1/4-inch headroom for expansion. Secure the lids and insert the sticks through the holes, making sure that they're straight and that 1 1/2 to 2 inches of each stick remains exposed. Slide the molds into the freezer. When the ice pops are firmly set—this will take about 2 hours in most freezers—they're ready to serve. Remove the lids from the molds, then either squeeze the sides of each mold to pop out the pop or invert the mold and run it briefly under warm water to release your icy treats. Riffs on Coconut-Lime Ice Pops: You can replace the lime zest with a little fresh mint (or even basil) to give the pops a very fresh and interesting flavor. A few drops of vanilla extract will focus the rich sweetness of the coconut. And a splash of rum (not too much, or the pops won't freeze solid) will make them taste like a tiki drink. Replace a quarter of the coconut milk with pureed pineapple and you'll have a piña colada on a stick. Looks good, can you add liquor to this recipe? Oh yeah. We recommend a splash of rum (but not too much, or the pops won’t freeze solid). Enjoy! Thank you for the pop recipe. I am going to make them soon. The ones I make I use condensed milk with the coconut milk, it is very rich and too sweet. I know I am going to love your recipe. Thank for telling me where to get the pop molds. I have been looking for them in different stores and I have not found them yet. This brings back sweet memories. We visited my moms hometown in Monterrey, Mexico very summer. The vendors were everywhere! Coconut was my favorite! Can’t wait to try it and share it with my family. Thank you for sharing. Ice pops are easy to make and has a unique flavor. The coconut milk makes it creamy and the lime makes it bold. Very good.